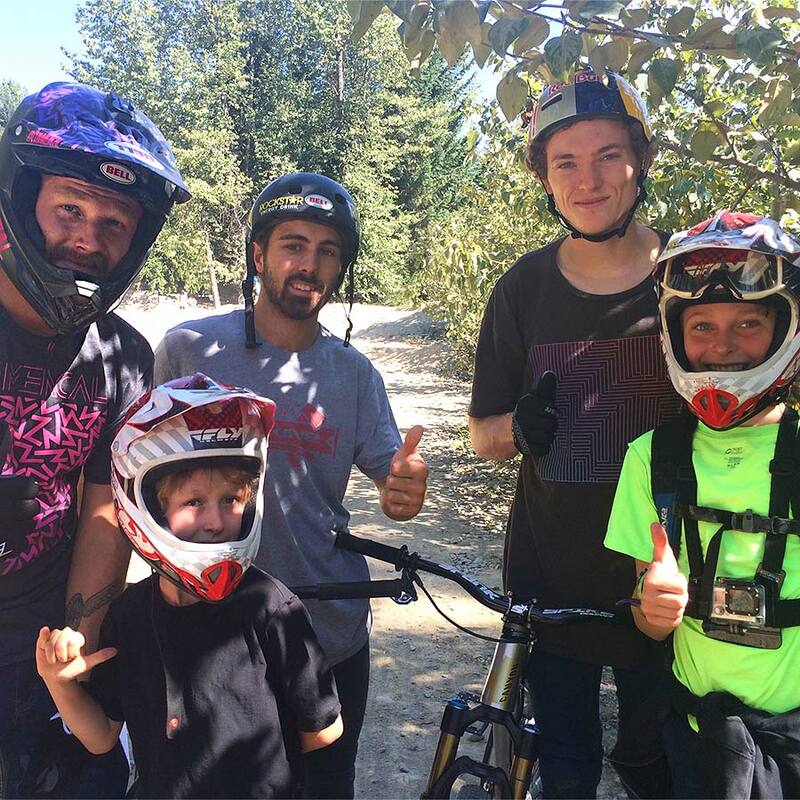 Whistler, British Columbia is an amazing place for a family mountain biking vacation. It has trails for mountain bikers of every ability and experience level. 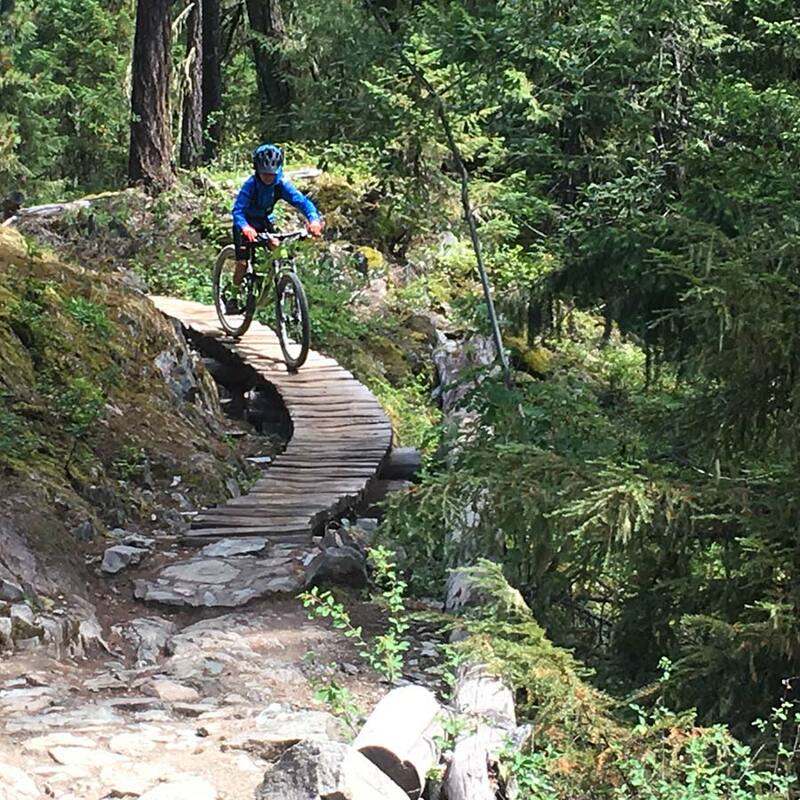 Over the last 6 years, we have ridden many – but nowhere near all of the trails Whistler has to offer. This is a bridge on the trail, Tin Pants. 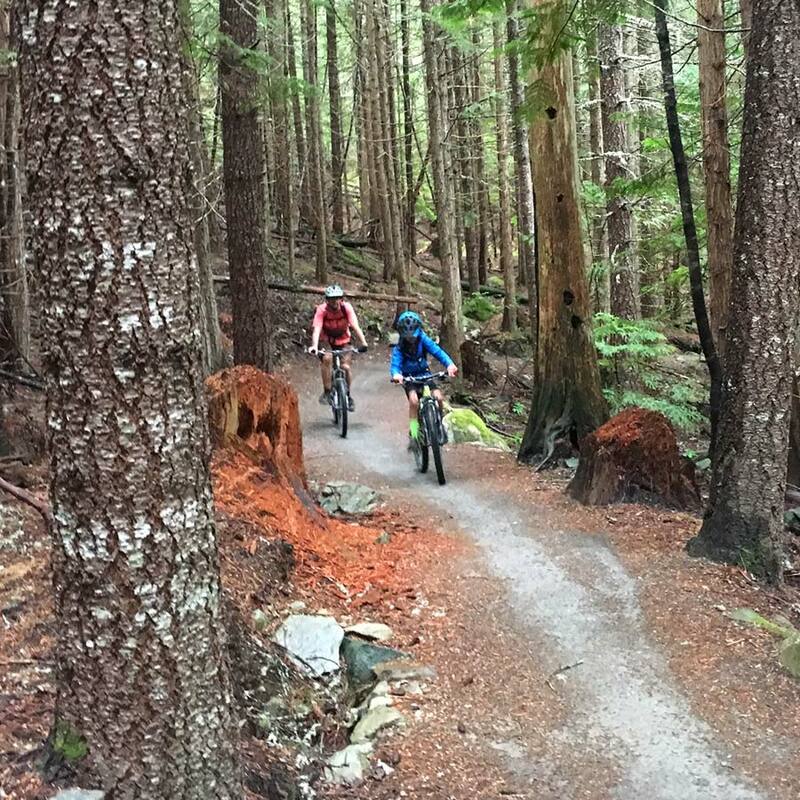 It's part of Whistler's Lost Lake Trail System and a wonderful area for kids' beginner mountain bike trails. Keep in mind that these trails are geared for young riders who are just getting started with mountain biking. Our kids started riding these trails on kids’ mountain bikes with 20 inch wheels and 24 inch wheel bikes. 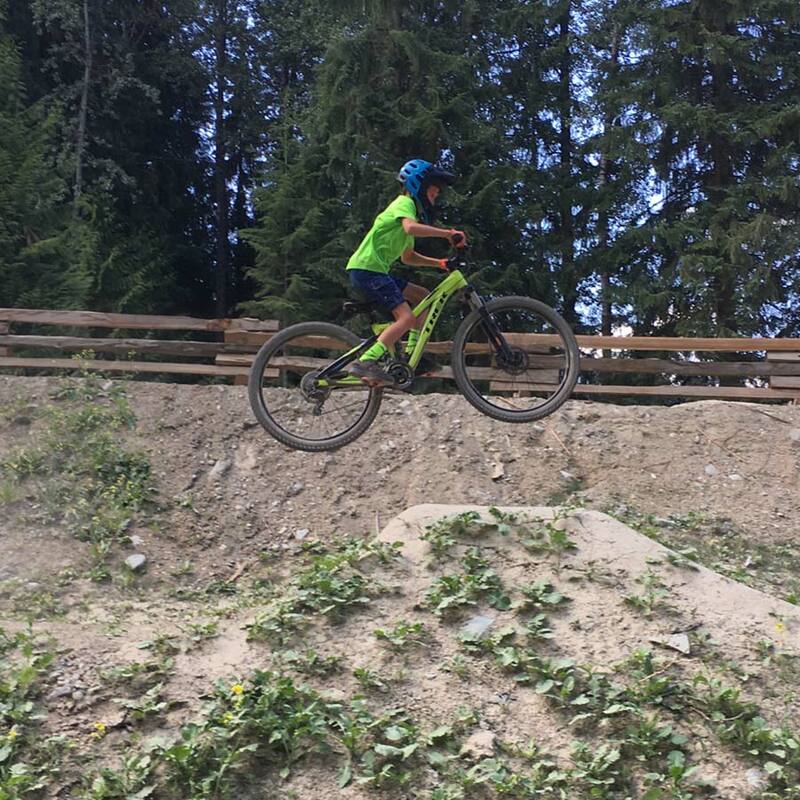 To ensure your children enjoy these trails safely, we strongly suggest you pre-ride them in order to properly gauge your young rider’s technical and endurance capabilities. Lets start off with riding some pavement. 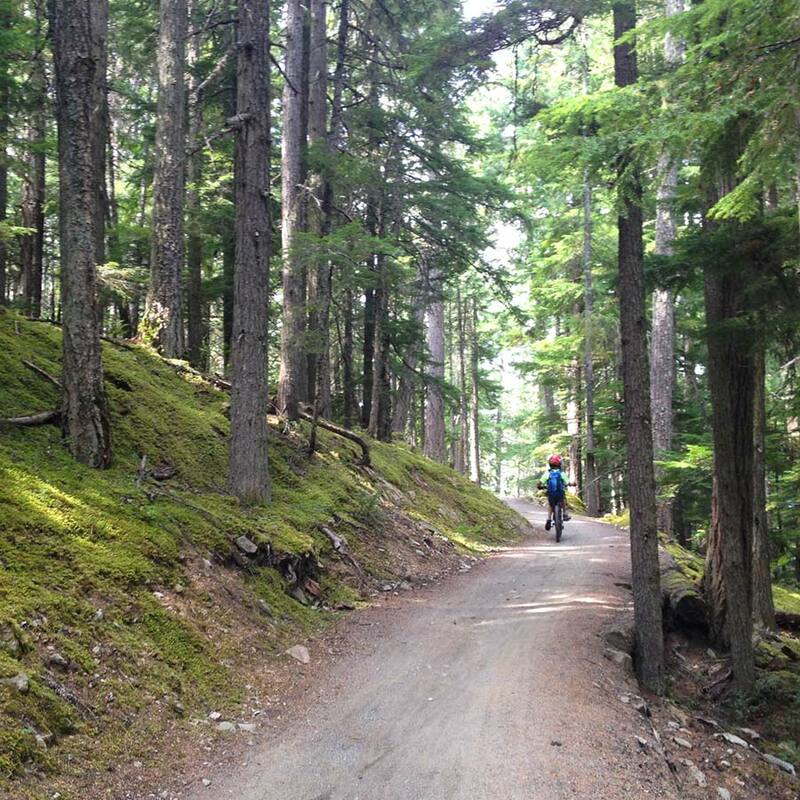 The Whistler Valley Trail System is one of the many things that make Whistler amazing. 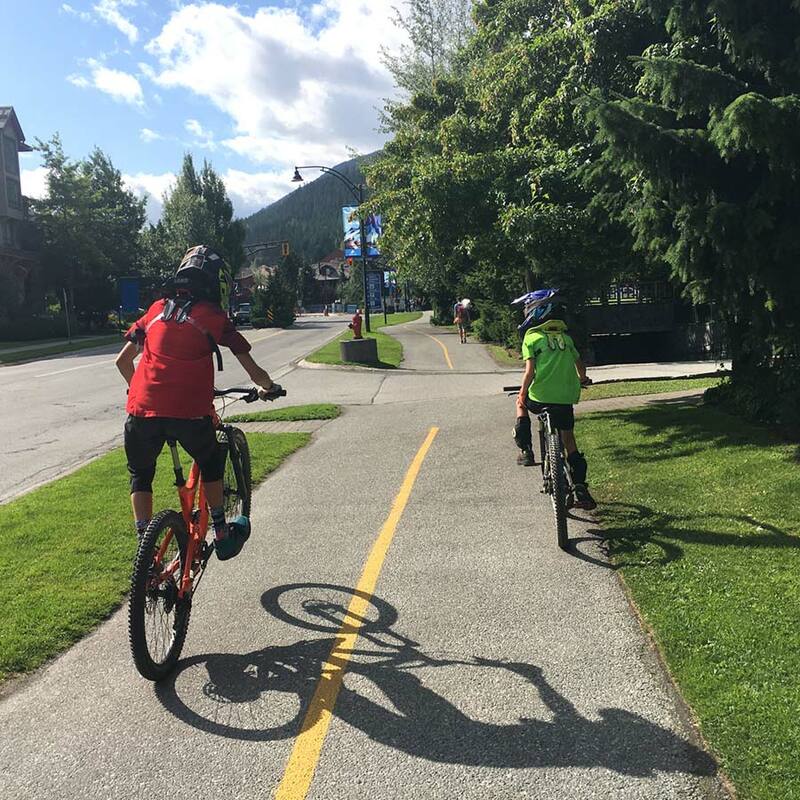 Composed of over 23 miles (40 km) of paved trails and boardwalk, the Whistler Valley Bike Trails are perfect for commuting to and from the Whistler and Blackcomb villages, neighborhoods, scenic lakes, and nearby mountain bike trails. We love the fact that we don’t use our van for the entire time we are in Whistler. These mostly flat trails are a fun way to explore the area on bikes with your family. All paths lead to the Whistler Bike Park! On the way to find some sweet Whistler single track. The Whistler Valley trails connect five Whistler lakes: Lost Lake, Green Lake, Alta Lake, Nita Lake and Alpha Lake. For a fun family ride, try Rainbow Park at Alta Lake. 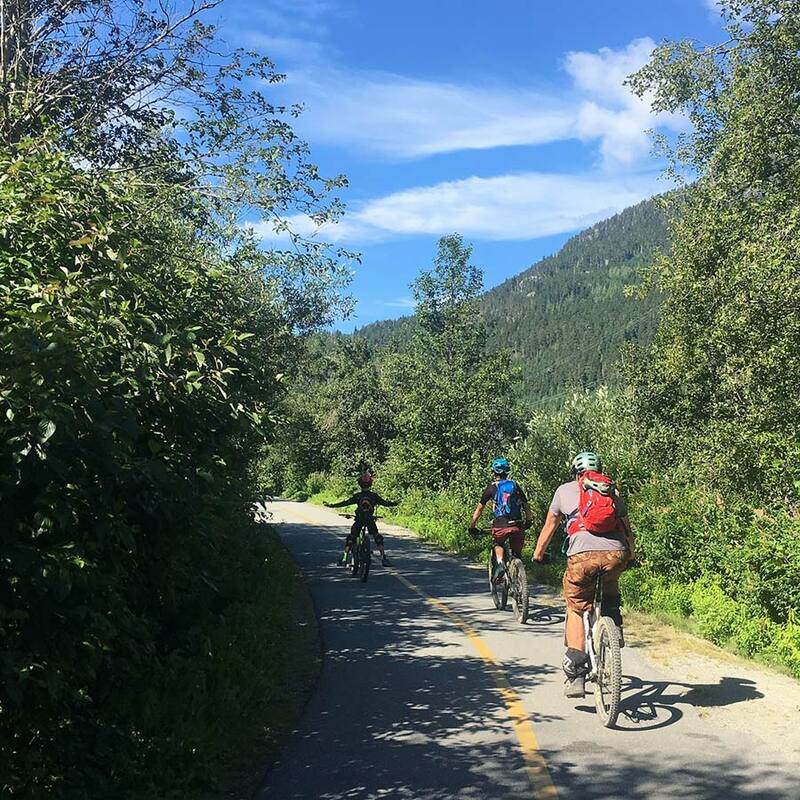 To get there, ride the Valley Trail west from Whistler Village through toward the Whistler Golf Course then through Whistler Cay following the signs to Rainbow Park. There’s lots to do at the park. Kids will enjoy the playground. Bring a picnic lunch and swim in the lake. This is a network of gravel access roads intersected by beginner to intermediate single track trails. These trails are beautifully designed and well maintained. They include a mix of packed pea gravel, narrow dirt single track, roots, rock rolls and wood bridges. Tin Pants – The trail name comes from a name for the stiff pants soaked in paraffin for waterproofing historically worn by lumbermen. 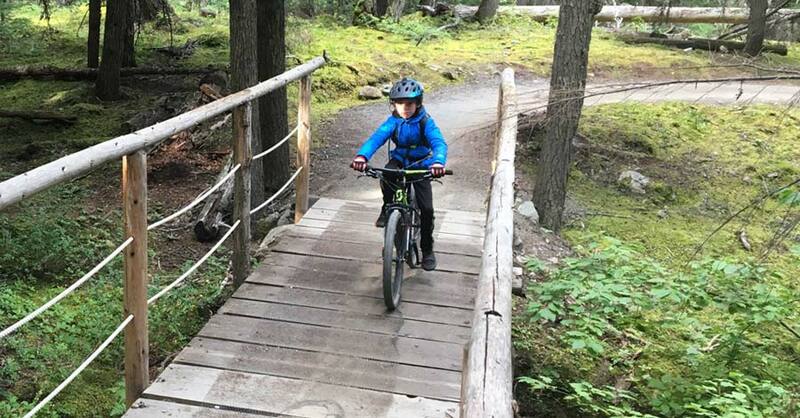 Riders of all abilities will enjoy this wide hard packed gravel trail that winds through beautiful lush forest and over lodgepole pine bridges. There are no technical sections to navigate on this trail which makes this an excellent introduction to mountain biking for true beginners. The climbs are steady but gradual. The descents are fun and flowy. Tin Pants is a multi-use trail with plenty of spots to pull over for other riders, runners or hikers. You may want to take a rest/snack break at the Rainbow Mountain viewpoint – our kids enjoy the decorated pine tree at that spot. Father and son climbing the Molly Hogan trail in Whistler. Pedaling up Tin Pants to earn some turns. Here's mom demonstrating how to ride The Grand Wazoo. Molly Hogan is another fun beginner trail in the Lost Lake area. Like Tin Pants, Molly Hogan is a wide and smooth compressed gravel trail. This beautifully crafted trail winds through thick forest along the East side of Lost Lake. This is the easiest trail on this loop. If you find this Molly Hogan to be enough of a challenge, you can make it an out and back – or drop down to the Lost Lake Loop trail and follow it back to your starting point. If you’re ready for some additional challenges, you can make this a fun loop by adding the following intermediate level blue/green trails. These natural dirt trails are narrower than Molly Hogan and feature beginner/intermediate difficulty root and rock obstacles. These trails are directly connected so that they seem like one longer trail. Excellent signage exists at each intersection to help you know when you finish one trail and start on the next. The first trail after Molly Hogan is Packard Goose. This short trail has some small rocks and roots to navigate. Packard Goose includes the steepest climb you’ll see on this loop. You’ll climb 52 feet in just over 600 feet of trail. Packard Goose is our kids’ least favorite part of this loop, so it’s nice that it is short. Next you’ll come to I’m Not Satisfied, another short trail (500 feet) that gradually climbs to the highest elevation of this loop. Up next is Why Johnny Can’t Read. This is where the fun begins. This trail has a few short rolling climbs but is mainly descending. You’ll experience several rock rolls and wood bridges. All of the obstacles are rollable, but nervous/novice riders will be able to safely walk any feature they choose not to ride. The grand finale of this loop is Grand Wazoo. Following a very short rolling section, you’ll end on a flowing and fun descent. There are several wood bridges over lovely little creeks and mossy forest views to enjoy in this section. You’ll finish the ride near the shore of Lost Lake. 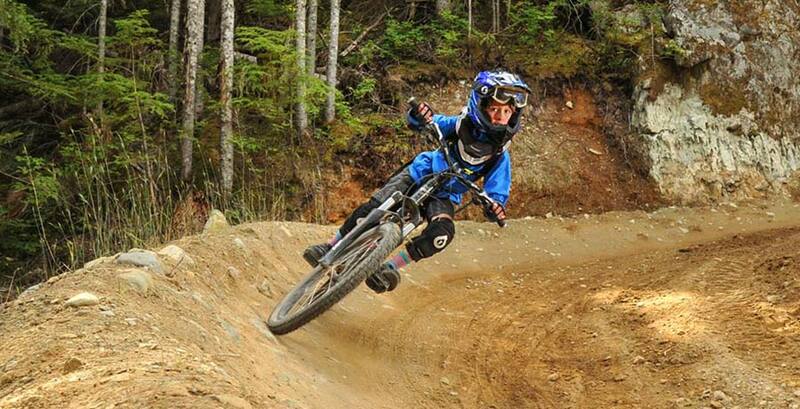 Ripping down EZ Does It in the Whistler Bike Park is a fine time no matter how old you are. 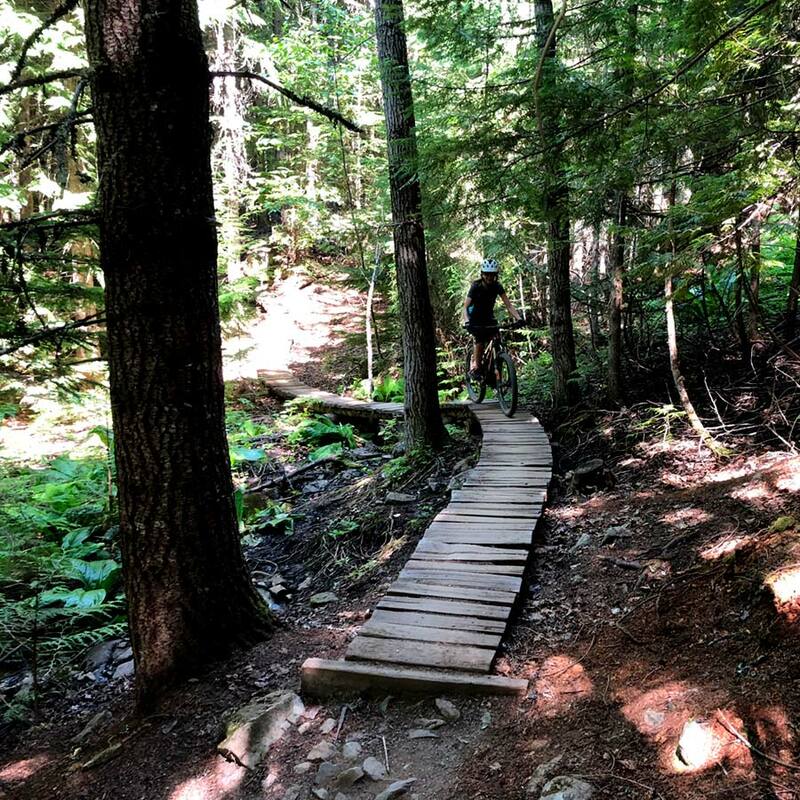 Located in the Fitzsimmons Zone, EZ Does It is the Whistler Bike Park’s signature beginner flow trail. This trail is the best bet for new riders to get comfortable with riding downhill. EZ Does It is a smooth machine-built trail that gently winds down the mountain for almost 3-miles. The high-banked corners are lots of fun. There are a few wood bridges that cross over some of the more advanced trails and a small tunnel. EZ Does It is a good warm-up for intermediate riders and provides all day fun for novices. There are also occasional more-challenging short-cuts or optional lines to throw in if you’re looking for a little more challenge. Intermediate riders may find it too mild to enjoy more than once but it does connect to a few green and blue tech trails that are worth riding. Del Bocca Vista is a super fun green technical trail that winds its way along and across EZ Does It. This narrow single track trail has a nice playful feel and includes turns and berms and beginner level tech over and around roots and rocks. This trail will help beginners to build skills and confidence. The trail is so well designed that more advanced riders often choose to ride it as a link between Dirt Merchant and A-Line. Remember that slower riders have the right of way on green trails. Although it can feel uncomfortable to be followed by faster riders, ride your line and don’t pull off the trail until there is a safe spot to do so. Del Boca Vista will dump you back onto EZ Does It for a smooth and flowy finish. 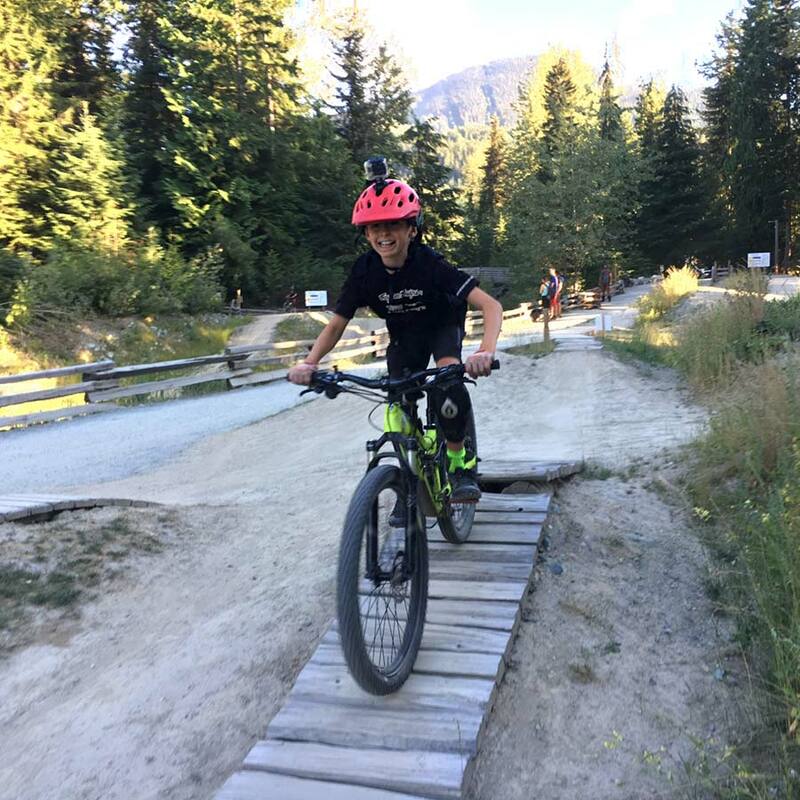 Located near Fitzsimmons Creek and the skate park on the edge of parking lot #3, the Fitzsimmons Creek Bike Park provides an opportunity to improve mountain bike skills and gain confidence riding obstacles and jumps. 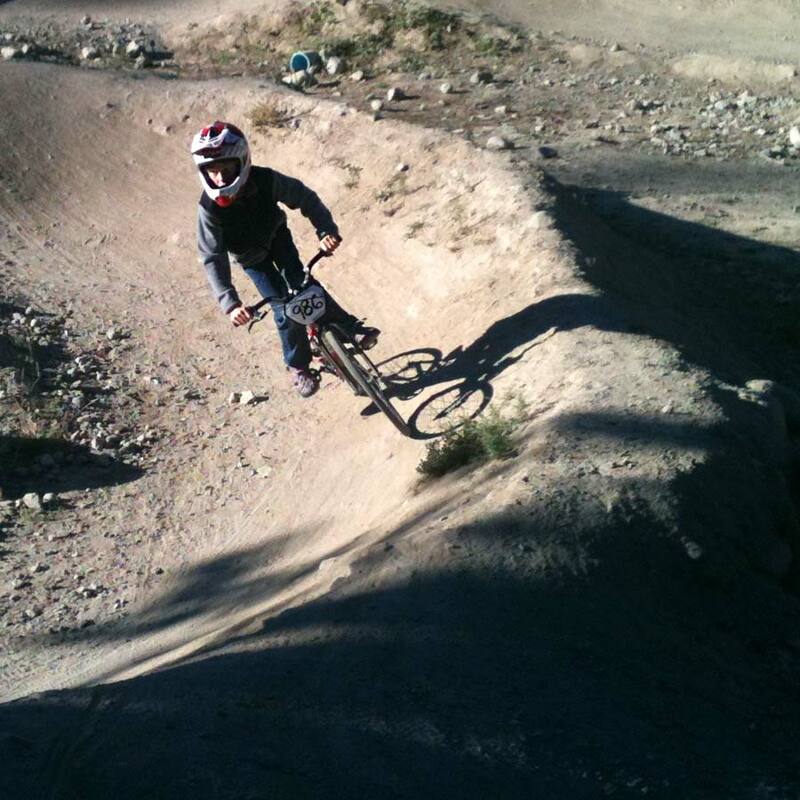 The park consists of dirt jumps, a pump track, beginner skills area and an intermediate skills area. Young riders can build confidence here! Recognize anyone in this shot? Moving on to the intermediate jump line. Beginner Skills Area – This area includes a series of small wooden rainbow bridges and little dirt features—perfect for kids to practice skills and build confidence. Intermediate Skills Area – The intermediate skills area has more technical challenges including log skinnies, roots and rocks. Pump Track – Located between the skatepark and the dirt jumps. This is a super fun area for kids to hone their cornering and bike handling skills. Dirt Jumps – There are jumps for every level of rider at this area. Kids and beginner riders can roll the smallest jump line, slowly building the confidence to get some air under their tires. It is inspiring to watch the more skilled riders hit the big lines. Note: Although the Whistler Skatepark looks like a fun place to bike, it’s also the only place for skateboarders to ride. If your kids choose to ride their bikes at the skatepark, you may feel the ire of those trying to skate. In the days when our kids really wanted to ride bikes at the skate park, we’d hit it first thing in the morning before the skateboarders arrived at the park and head back for breakfast when skaters showed up.